At five o'clock a special general meeting of the Huddersfield Improvement Commissioners was held in the ground intended for the new Cemetery at Edgerton, for the purpose of receiving and taking possession of the 12 acres of land from the agents of Sir J. W. Ramsden, and turning the first sod of the New Cemetery. Though the rain was incessant and heavy, there was a very numerous attendance of commissioners; and shortly after the hour named, George Loch, Esq., with a new and beautiful spade provided by the Commissioners for the purpose, dug up a sod, and presented it to Joseph Brook, Esq., the chairman of the Commissioners, saying that he in the name and on behalf of Sir J W Ramsden, delivered up possession of the plot of ground on which they were standing, to be appropriated and used, and kept sacred as a burial place for the dead of the township of Huddersfield for ever. Mr Joseph Brook accepted possession in the name and on behalf of the Improvement Commissioners and the inhabitants of Huddersfield; and after congratulating the Commissioners on the success which had attended their efforts to provide a large and well-appointed burial-place for the inhabitants of this important district, and that too in despite of the numerous and peculiar difficulties which had beset their path, he expressed a fervent hope and belief that their undertaking when completed, would, under the blessing of God, prove to be of benefit to the district both in a sanitary and moral point of view. He also bore his personal testimony to the anxiety evinced by the trustees of Sir J. W. Ramsden that appropriate provision should be made for the interment of the dead; and instanced their liberal donation of one half the cost of the land, or £1777 for the purpose of beautifying and decorating the New Cemetery, in proof of their desire that the new burial-place for the dead should be inferior to none in the kingdom. Mr Loch briefly acknowledged on behalf of the trustees the testimony borne to their efforts and intentions by the Chairman of the Commissioners; and also gave expression to a fervent hope that the undertaking then commenced would long continue to be a benefit to the town, and worthy of the public spirited inhabitants of the district. Fenay Hall, 13th September, 1852. Dear Sir,_ I am greatly obliged by the invitation from the Huddersfield Improvement Commissioners, to dine with them on the 13th instant, the day on which Sir J. W. Ramsden attains his majority, and I greatly regret that my suffering from sciatica, rheumatic gout, will prevent my having the great pleasure of making one of their party on that day. Other letters in the same vein followed. 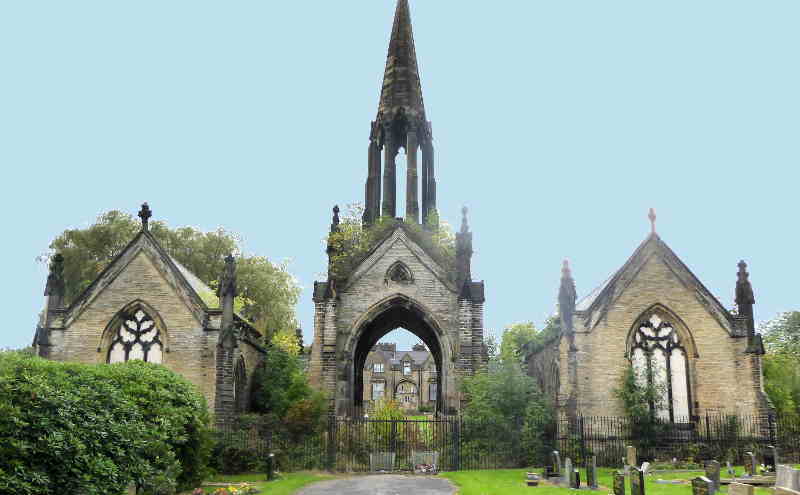 In March 1853 the Improvement Commissioners advertised for tenders to be submitted for the construction of Enclosure Walls and the Cemetery Chapels. It was these two chapels that were to become the subject of much controversy. In 1855 the paper reported “Settlement of the Cemetery Dispute”. Apparently the Bishop of Ripon was satisfied that the dispute in reference to the position of the two chapels had been settled. The dispute arose as to whether a church chapel should or should not be connected with a dissenting chapel by means of a crowned arch. OPENING OF THE CEMETERY AT EDGERTON. The public are respectfully informed that the above CEMETERY will be OPENED for Interments by the Improvement Commissioners on Monday next, the 8th Instant, when Divine Service will be conducted in the Chapel built upon the Unconsecrated portion of the Ground by the following Ministers:- Rev. J. HUDSTON, Rev. J. CHISHOLM, Rev. J. K. MONTGOMERY, and Rev. J.STOKOE. The Improvement Commisioners will meet at the Commissioners Offices, No. 1 South Parade, at Ten a.m. And will walk in Procession to the Cemetery; and they respectfully invite the Ratepayers to join them in the Procession, and for that purpose to meet them at the Commissioners' Offices at the time named. The Huddersfield Cemetery.- On Monday last the public cemetery at Edgerton, for the Township of Huddersfield, was formally opened for the purpose of Interments. The cemetery contains some 12 ½ acres, surrounded on three sides by a stone wall, and on the fourth side a dwarf wall, with handsome railings and stone pillars. The cost of the cemetery, including land and enclosing, the chapels (two), lodges, formation, and planting, closely approximates £13,000.